I’m excited to share with you a brand new tool to help you become productive during Ramadan. 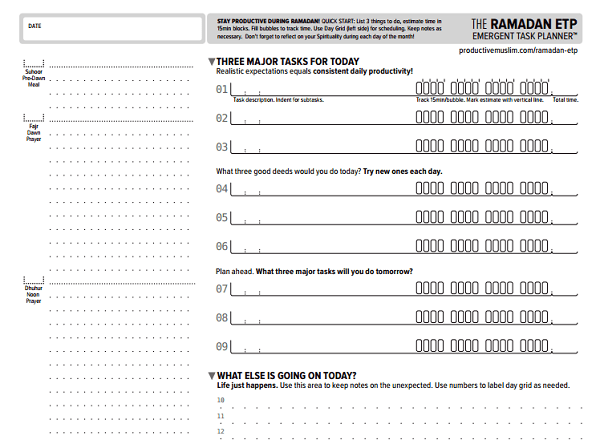 It’s called the Ramadan Emergent Task Planner (ETP). This is a unique Ramadan time management tool designed by our friend and productivity design guru, David Seah from DavidSeah.com. If you haven’t come across David’s work before, he designs pretty cool paper-based productivity tools that help people manage day to day productivity in the most efficient and effective manner. I got in touch with David last month and asked him to do a special paper-based productivity tool for Ramadan, he gladly agreed, and the result is the Ramadan ETP. >> Can’t see the video in your email? Click here to watch it. It’s been exciting working with David on this tool and I hope you’ll love it! Please give us your comments & feedback below.